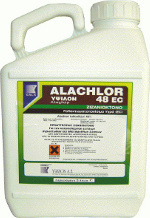 A container of alachlor 48 EC herbicide. Alachlor is a common herbicide used to control annual grasses and other weeds in corn, soybean, and peanut crops. It can be found under the trade names of Alanex, Bronco, Cannon, Crop Star, Intrro, Lariat, Lasso, Micro-Tech, and Partner. Itâ€™s been deemed to be slightly toxic by the United States Environmental Protection Agency, causing skin and eye irritation, potential damage to the liver, kidney, spleen, nose, eyelids, and may also cause cancer. How alachlor makes its way into the water supply is easier than you may think. Runoff caused by rain or irrigation flushes the chemical into the surface water. As it flows through the soil, the chemical dissolves and is carried down into groundwater, where itâ€™s introduced into the wells and springs that connect to our water supply.